A wide range of businesses have installed Smoke Screen to protect electronics, computers, designer clothing, jewellery, tyres, cash, cigarettes, spirits and much more. The design and manufacture of each system is the the highest, international, quality assurance standard. The 'smoke' itself has been tested by an international electronics company and the Atomic Energy Agency. Smoke Screen is the choice of professional alarm installers, national insurers and a wide variety of well known companies, such as Carlsberg-Tetley, Tesco Stores, Goodyear, Q8 and Delmonte. 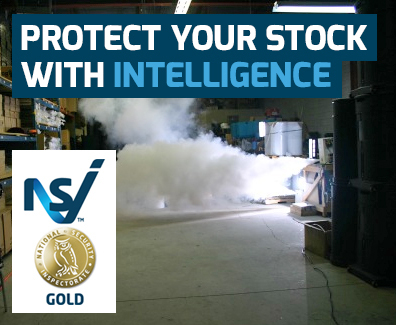 For more information about smoke screen systems and how you can protect your valuable stock, simply contact our team here at Aztek Services. Police forces throughout the UK receive more than 100,000 genuine alarm calls from monitored alarm systems, every year. 95% of the time criminals have departed before the Police can respond. Gangs of thieves are able to smash their way into shops and offices, steal thousands of pounds worth of property and escape, all in a matter of minutes. Intruder alarms have little effect, physical security, such as bars and grilles, merely raise the level of violence employed by the criminal in his attack on your premises. Smoke Screen systems confront the criminal, presenting him with an impenetrable barrier of dense, white screening smoke. The speed with which the smoke is produced provides a physical deterrent, preventing entry into the protected area and at the same time concealing valuables under a protective blanket. The smoke is non-toxic and non-contaminating, making it suitable for use inall types of premises: A corner shop or superstore, a one-man office or a modern office complex.